Are You A Biryani Lover Too? When it comes to Indians and food, many emotions come out. We treat food like god, we love it, we crave for it and we are absolutely crazy about it. Our country has a wide variation when it comes to food and this is why we have been blessed with a number of cuisines and needless to say they are all loved by us Indians. Apart from the cuisines that have seen its origin in India itself, we have adapted or adopted many cuisines from outside as well. India has a huge history of rulers from all over which has left its mark as different food cuisine. The early years when India was invaded by the Mughals, who ever knew they would bring in one such food delicacy which will be loved by all? If you think I am talking about biryani, then your guess is absolutely correct. Biryani for me is more than just a food dish. It has emotions and feelings, its love for me! I am sure many of you guys must be sharing this same feeling as me. There has been a long debate over veg biryani and chicken biryani. People have been arguing for years, that if a particular biryani doesn’t have any sort of meat in it, it cannot be called a biryani because then it simply becomes a pulao. But today, we are not going to get into that debate. People who still prefer calling in veg biryani, there is good news for you because restaurants do have the option of veg biryani on their menus. And it is quite easy to prepare than chicken or mutton biryani. So all vegetarians out there you could easily find veg biryani recipe in Marathi, English, Hindi, Gujarati, and Oriya etc. Choose your preferred language to take out this simple recipe from the internet and try it out at your home. The rest of us let us move on to some of the basic facts of biryani. Let’s see facts about the dish we love so much are known to you folks or not! 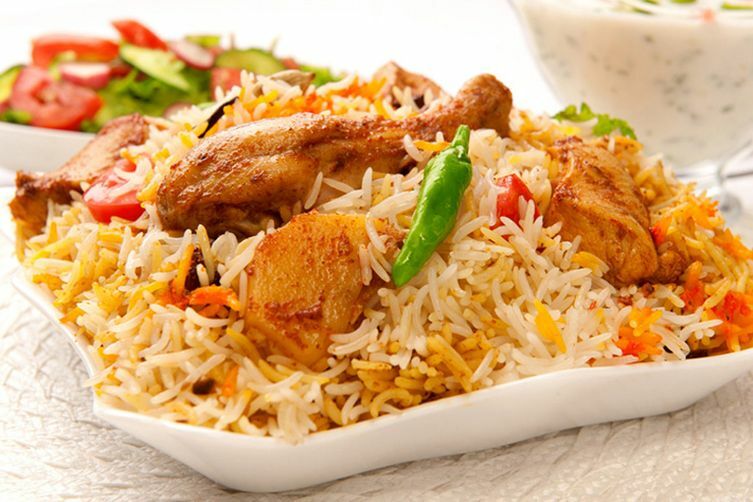 Biryani is a South Asian dish which is primarily made of fragranced rice and pieces of meat. The kind of meat in the biryani is up to your own choice and preference. You could opt for chicken biryani, mutton biryani, fish biryani or beef biryani. It is a Mughal dish that came into our country upon the invasion of the Mughal emperors. It is to be believed that the Royal Mughal cooks were the best at making this dish and it as prepared in each and very big occasion in the older times. There are over 30-40 variations of biryani that are eaten in our country today. Hyderabadi biryani, Kolkata biryani, Awadhi biryani, chettinad biryani are just a few names amongst them. This dish has found its place in people’s heart across seas too. It is eaten the US and the UK too. Biryani is mostly accompanied by raita which is a curd side dish. But you might be surprised that this is not the trend everywhere in our country.